1.Prepare the dough: In a large bowl, add the flour, make a hole, crumble the fresh yeast, add the lukewarm milk and melt the yeast with your hands. Add the other ingredients for the dough; knead until the dough is nice and smooth. Add more flour if the dough is sticky. 2.Make the doughnuts: sprinkle a baking tray with flour; divide dough into 20 balls, roll with your hands. Place on baking tray. Cover the baking tray and place it somewhere warm to double in size (1 to 1,1/2 hours). Meanwhile, make the custard. 3.Fry the doughnuts: Add enough oil to frying pan so it comes half way up the sides of the pot, allow it to come up to 350 degrees. Once the donuts have risen, gently lower them into the hot oil and fry them for about 3 minutes on each side or until puffed and golden brown. Take them out of the hot oil and place them on a paper towel lined baking sheet to drain the excess oil. 4.While the donuts cool a bit, make the ganache: Heat the cream in a small pan over medium heat until just below boiling point. Pour the heated cream over the chocolate chips and let sit for 1 minute, whisk it all together until the chocolate is fully melted; set aside. 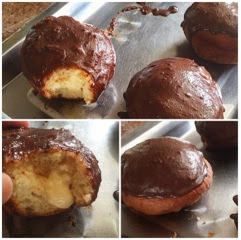 6.Swirl the top of the donut in the ganache and allow them to sit and rest for about 10 minutes before serving.